Leading Manufacturer of magnetic drum separator, drawer magnet, magnetic sweeper, magnetic pulley, permanent type magnetic concentrator and over band magnetic separator from Vadodara. 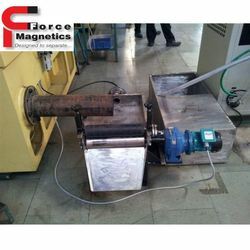 Magnetic Drum Separator offered comes backed with powerful permanent magnet support that allows automatic separation of ferrous and non ferrous metals. These are suitable for finely separating ferrous material from product and work on permanent magnetic field, thus providing savings on precious electricity costs. We can offer these with automatic /manual operating system support. The drum will comprise three forth area with permanent magnet. Hence it will remain effective only on there forth area. 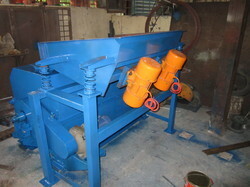 Hence this will help to separate ferrous and non ferrous material feeded on drum. The drum will rotate at slow speed with help of geared motor. The drum will be made of non-magnet material. It is very useful when separation efficiency is to be achieved. Separation is made automatically for ferrous and ferrous material. Totally enclosed, hence dusting is prevented. We are offering premium Drawer Magnet from our huge assortment of magnetic equipment. It is used in different applications that require dry processing and consists of round magnetic tubes that are gathered in drawers. The alternative organization facilitates the product to cascade in zigzag pattern securing flawless capturing of tramp material due to direct and repeated contacts. We use the finest metal alloys and magnets to ensure trustworthy performance and suggest this at leading industry rates. Magnetic Sweeper offered comprise systems designed for the reduction in work injuries as well as from possible vehicle damages and are designed to efficiently and quickly clear important traffic areas from dangerous scrap iron, thus reducing possibilities of flat tires. 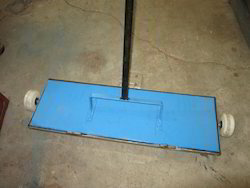 We hold expertise in delivering powerful magnetic sweepers for virtually any job size that can be made available with/without easy load release. The permanent magnet plate of will be cover with S. S. plate and there are two wheels on either side to move from one place to another place. As it is designed to keep away from ground level to a tract all ferrous material which passes through and can be de magnetize immediately by hand lever or pedal lever. Magnetic Pulley offered comprises the femoral type of magnet with no electric power carbon brush support. Providing operations as the head pulley on belt conveyor support, these are less costly as well as self-cleaning magnets that find usage in the removal of tramp iron. As high strength permanent magnet pulleys, these provide for optimum process support in every conceivable application requiring purification and uninterrupted tramp iron protection. Magnetic pulley shell will be made of nonmagnetic material. It will have magnetic assembly through out the circumference and create magnetic flux all around. It will be driven by the geared motor with convener belt to separate magnetic and nonmagnetic and non-magnetic material. Unlike electro magnetic type where more maintenance prone accessories to be used, it is very compact and will not require any power to create magnetic flux as it consists of permanent magnetic. We are one of the leading manufacturers & suppliers of Permanent Type Magnetic Concentrator. Very good for separation of ferrous material from cast iron boring, steel, brass, aluminum turning, chip material. Purification of dry ceramic and refractory material. 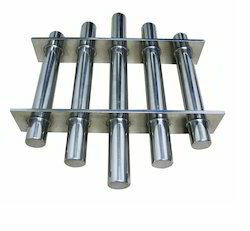 We are the manufacturer of Over Band Magnetic Separator (Self Cleaning). It consists of two rolled and driven by geared motor at center stationery magnet is fixed and belt is passing through the magnet. During this oration if any trump iron is detected on surface of belt conveyor. It will be attracted towards magnet and discharge once intersib of magnet field is over. This tube of design is recommended when there will be high amount ferrous material is detected. Very safe in flame proof area. Very much recommended in dusty humid and hostile condition. No power supply is required for magnet hence no maintenance. Very idea when no man power is available being a self cleaning design. Separate ferrous material from coal handling plant. Useful in collect ferrous material form slag. Separate chills, swaggers from foundry . Recommend to use in waste recycle to collect ferrous material. 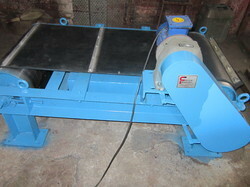 It is useful the use before pulverizes,screw conveyor, roto feeder etc. Magnetic Coolant Separators offeredare made available by us with the slotted type powerful magnetic drum with stainless steel housing support. For efficient performance support, these come with squeezed roller support with neoprene rubber coating and in-built bearing provision. Supporting the demands of magnetic coolant filtration, these are used in different industry sectors like engineering, automobile, bearings, spindles, wire drawing and others. 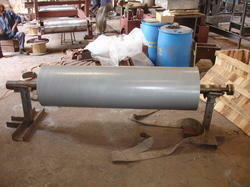 S.S. Made tank will equip magnetic roller rotating at low speed with the help of the Geared motor. During this operation a used coolant is discharged into the tank due to magnetic force on roller the ferrous particle in the coolant will get attracted to a magnetic roller and at the same time at the other end will remove by S.S. Scrapper fitted at front. Self-cleaning process no alternative is required hence it has found user-friendly. Reuse coolant fluid and becomes viable as ultimately saves on money. All CNC m/c where coolant fluid is under use can be designed for 50 lpm to 500 lpm. We are one of the leading manufacturers & suppliers of Hopper Magnet. Shapes and sizes: disc, ring, block, segment, cylinder, trapezoid, customized design.